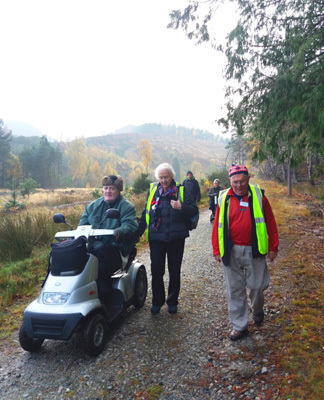 We were pleased to welcome Suzanne Barr to tell us about the history and the current management and activities taking place at Abriachan Forest above Loch Ness. 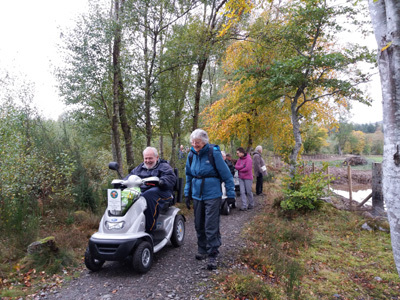 In 1991 the Trust was set up as a charity when the community of Abriachan bought the forest area from the Forestry Commission. The forest consisted mainly of lodgepole pine and spruce which were not profitable for the FC. The Trust began to manage the forest by gradually removing some of the poorer trees to open up the area and make it more attractive to visitors. The Trust continues to manage the forest by selective felling and replanting with native trees. They obtained an agreement to allow public access to all of the area. 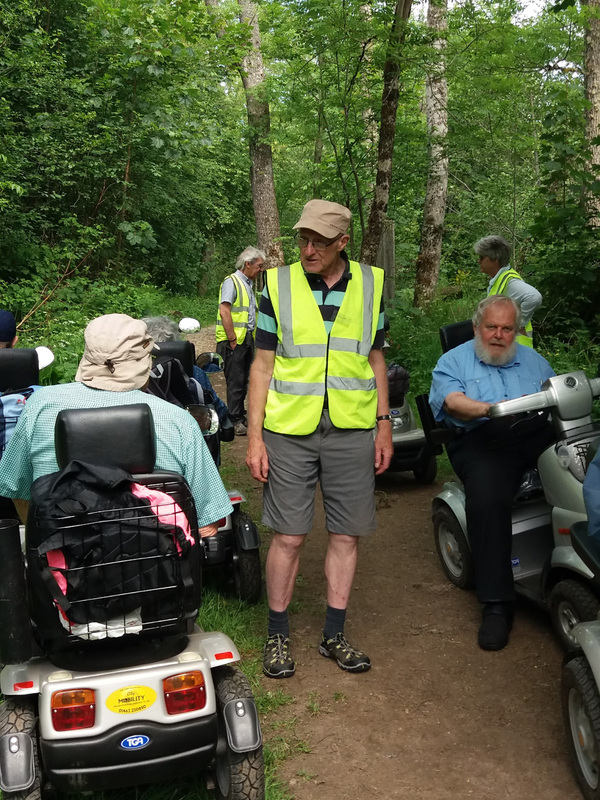 Over the years they have improved and put in new paths as well as two log cabins and a composting toilet. There is a children’s play area and tree house as well as reconstructions of a Bronze Age roundhouse and a shieling. There are now cycle trails and an all abilities trail. 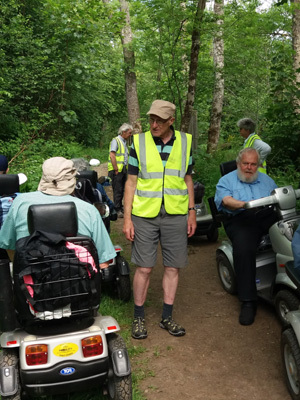 As well as visiting school groups and the public, the Trust run initiatives to encourage those with special needs of many kinds to take part in conservation work and activities. They provide unique opportunities for those not catered for by mainstream education, and in return, their woodworking, art work and other products are seen by all visitors along the trails. The Trust can continue its progammes only by constant fundraising and seeking volunteers to augment the staff to help with the conservation and education work. 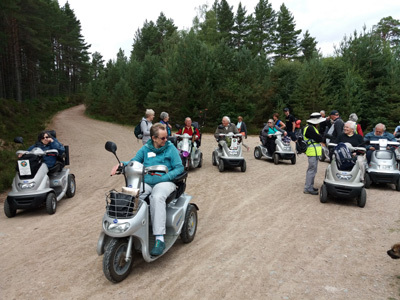 HDR has a visit planned to Abriachan on 8th August this year, so we look forward to enjoying a ramble through this unique forest area. We gathered as usual in Inshes Church for a soup and sandwich lunch followed by Peggie’s famous quiz. This is always the highlight of the winter indoor programme. It was even more special this year because we were able to welcome Peggy back after a hospital stay and period of recuperation. Peggie somehow managed this time away from HDR to ensure the quiz was not disrupted in any way! We divided into several teams decided by no more than where we sat for lunch so the size of team varied from 3 to 5 – all fair and square there then. There were several rounds and each team could pick one round to play the team joker card for a chance to earn double points. A definite advantage for the quiz is to have good hearing because then you are likely to hear the correct answer as a stage whisper from several tables at once. It was good fun and we enjoyed trying to make the brain cells and memory work even if they were not always willing. So thank you Peggie for a great afternoon’s entertainment. Following the quiz Janet spoke about her job providing support services for the visually impaired. She covers the whole of Highland and is based in the Eye Clinic in Raigmore Hospital. Janet told us about the services and support she is able to offer and how to contact her. As we welcomed Peggie back we also had to say goodbye to Nigel who is moving away from Highland. Nigel has been a mainstay of the Van Team who all work hard to ensure the scooters are where they need to be at the beginning and end of our rambles. So thank you Nigel for all your hard work and friendship over the last few years and we wish you all success in the future. On Thursday 24th January we had the first of our winter meetings, and Elspeth gave us a talk and slide show covering her trip to Ethiopia in 2008. This is a country packed full of spectacular landscapes, fascinating wildlife and warm and welcoming people. Elspeth visited as part of a small-group tour, about 15 people, with local guides. The tour began in the capital, Addis Ababa, a vibrant and bustling city, a curious mix of modern development and donkey carts. From Addis the group went north to Lake Tana, Ethiopia’s largest lake and the source of the Blue Nile. Lake Tana has a lot of islands, many with monasteries on them (over 60% of the population are Christian, mostly Ethiopian Orthodox.). A fisherman was paddling his papyrus boat, as his ancestors must have done for thousands of years. 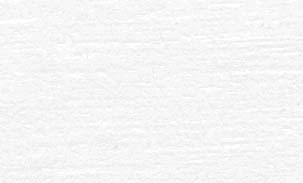 After that they visited a beautiful cataract on the Blue Nile itself, and walked down to its base. In the ancient city of Gondar they saw the walled fortress and palace compound, once the seat of Ethiopian emperors, with the immense 17th-century castle of Emperor Fasilidas. The next destination was the Simien Mountains, a wild and rugged area close to the Eritrean border. This was bandit country, and armed guards were much in evidence, as well as Gelada Baboons, with their distinctive red “bleeding heart” chest patch. The baboons live in very large groups, and seem to enjoy posing for photographs! On to Aksum, once the capital of the Aksumite Kingdom, and known for its obelisks, or stelae; they range from standing stones reminiscent of Callanish or Brodgar to huge and elaborately-carved obelisks. The 24-metre Obelisk of Axum was looted by Italy and shipped to Rome in 1937, finally being returned in 2005. The New Cathedral of St. Mary of Zion stands next to the old one, and was built in the 1950s. The small chapel known as the Chapel of the Tablet was built at the same time, and is believed to house the Ark of the Covenant, brought from Jerusalem by the son of Solomon and the Queen of Sheba, whose Palace is here. Admittance to the chapel is closed to all but its guardian monk – even the Patriarch of the Orthodox Church isn’t allowed in! At Lalibela are the breathtaking rock-hewn churches. These are carved into the solid bedrock, their roofs level with the surrounding ground, each with a deep “trench” carved down and the church, carefully hollowed out, standing in the centre. They are world-famous, and rightly so, an extraordinary feat. There are 11 churches in all, and the Church of St George is generally considered the finest. A final stop in Harar, a Muslim area with an ancient walled city packed with narrow alleyways and market stalls. Finally visiting an animal market where cattle and camels were traded, before heading back to Addis. All in all it was a fascinating glimpse of a little-known country, and I think I wasn’t the only one wondering where my passport was by the time we returned to a chilly Inverness afternoon! Thank you, Elspeth. 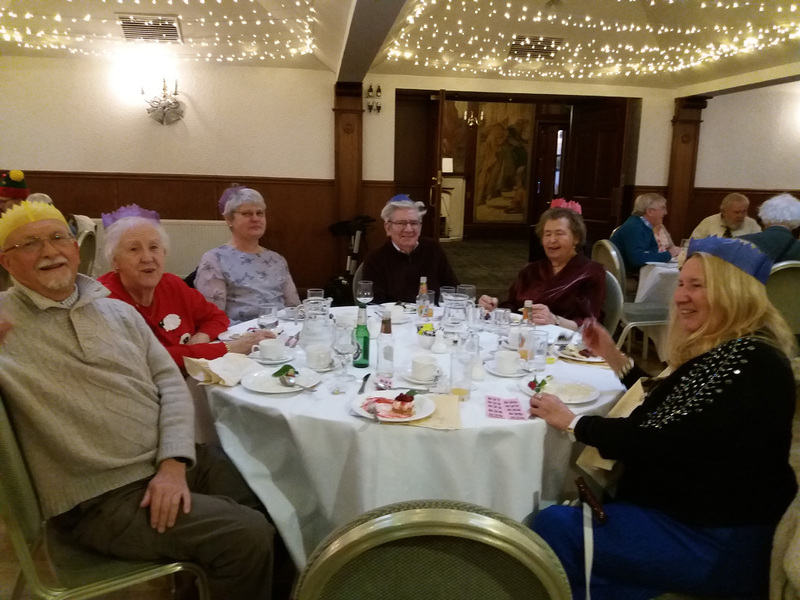 On 7th December, 37 members and friends assembled at Lochardil Hotel, Inverness, for our annual Christmas lunch. We missed Martin, and Juliet and her sister Hilary who had to call off due to illness. We hope they made a speedy recovery. The sizable dining room with 5 large tables allowed us plenty space for wheelchair and rollators, and the toilets were easily accessible. 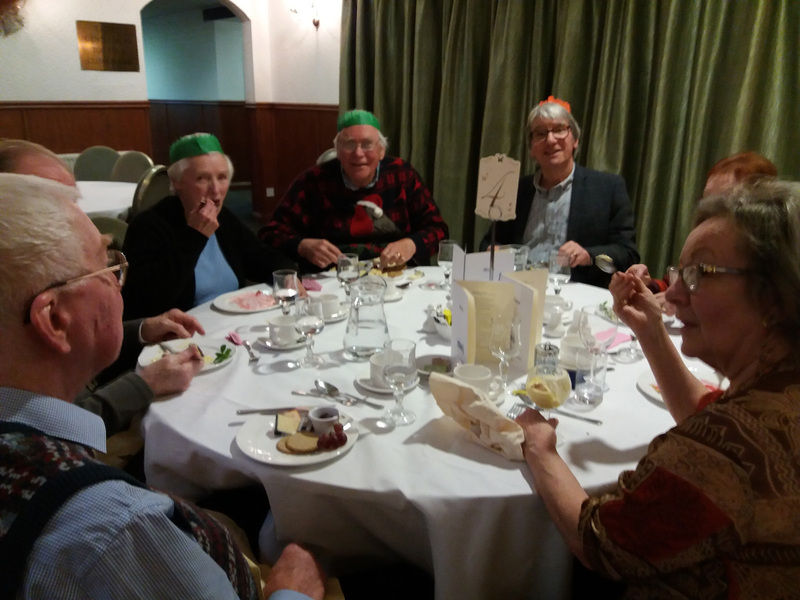 We had a varied menu to choose from as well as the traditional turkey and Christmas pudding. There was lots of chatter and hilarity with folk renewing old friendships and making new ones, and exchanging news. After our dessert it was time to draw the raffle, Victor having earlier persuaded folk to buy tickets. Steve called out the numbers while Janet helped the ticket winners choose from the wide selection of prizes kindly donated by our members. A total of £84 was raised for our HDR funds. (Just to add that the total raised from all our raffles this year is £332. Thank you to everyone who has contributed). The waiting and hotel staff had been very efficient and helpful, so were rewarded by our round of tips. Our thanks go to Suzanna for booking the hotel and Rosemary for organising all the payments. All enjoyed a tasty and sociable event. The ramble to Fairburn and the river Orrin was the last for this year, and a very successful one too. Although Fairburn is noted for the Palmate Newt with webbed rear feet, the weather was very kind to us, grey(ish) but otherwise very acceptable. 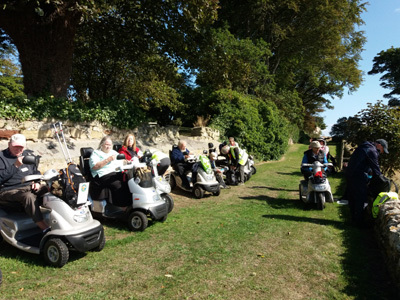 All 10 scooters were booked but sadly Peggie could not make it as her hip was giving her problems. We were joined by new members Donna Ross and her cousin Fraser and friend Garry and a very good number of volunteers and friends. How rewarding it is to have such support. Organised by John and Rosemary, and we thank them most sincerely. John started by giving us a very comprehensive history and background to the estate, 21,000 acres ... wow, that’s a lot! Obviously the estate has been very progressive over the years with building work, hydro electricity and lots of tree planting in the mid 19th century. We saw some magnificent Silver Firs, one monster Douglas Fir log, and well managed conifer and broadleaved woodland. And then the River Orrin with its waterfalls, absolutely beautiful. The estate worker clearing leaves from the Hydro pond must have wondered what was going on when his peace was disturbed by 10 scooter people, and an array of the paparazzi photographing him with their mobile phones! Fame at last! Once again thanks to all involved in giving us a splendid end to a very successful year’s rambling. We look forward to the winter meetings. We carried on up to the geological maze, a circular labyrinth of stones and rocks from all over the highlands. This made a number of us smile as there was no way out, so buggies were turned around and we came out the way we went in! Time was getting on so it was unanimously decided to stop here for lunch. A number of the “walkers” were able to perch on the rocks and so were relatively comfortable. 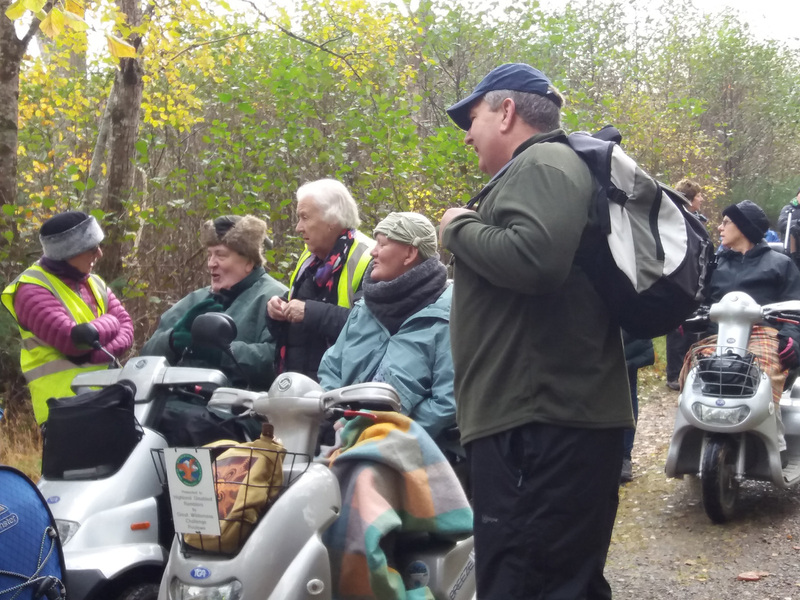 Elspeth gave a short talk on various fungi etc, which many found of interest. When we were fed and watered we continued up the path. We saw several trees with bracket fungi on them, quite spectacular; a few fungi were collected by those who knew what ones were edible! We continued on our way and soon came across a wooden chalet with the most spectacular statues carved by chainsaw from the trees, everything from people to forest animals. Back to the car park and scooters put into vans we all went our separate ways. We had a good day out made all the better as it was calm and dry! 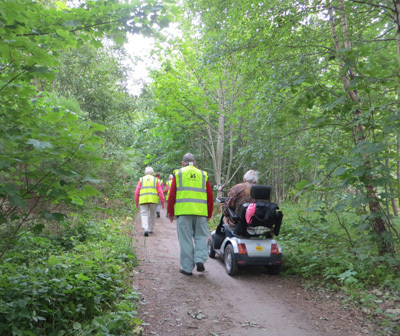 Our thanks go to all the volunteers and carers who made this possible. After having postponed the ramble from the previous week because of a forecasted storm (not something that happens to us very often!) we gathered in Grantown on Tuesday 25th September, to discover that the public toilets in the public car park were closed for the winter. However we were made welcome to use the toilets in the Museum across the road. After this promising start, we were off. We welcomed two new members, Trevor and Viv, and two new volunteers, Fraser and Gary, both pairs with well-behaved dogs. 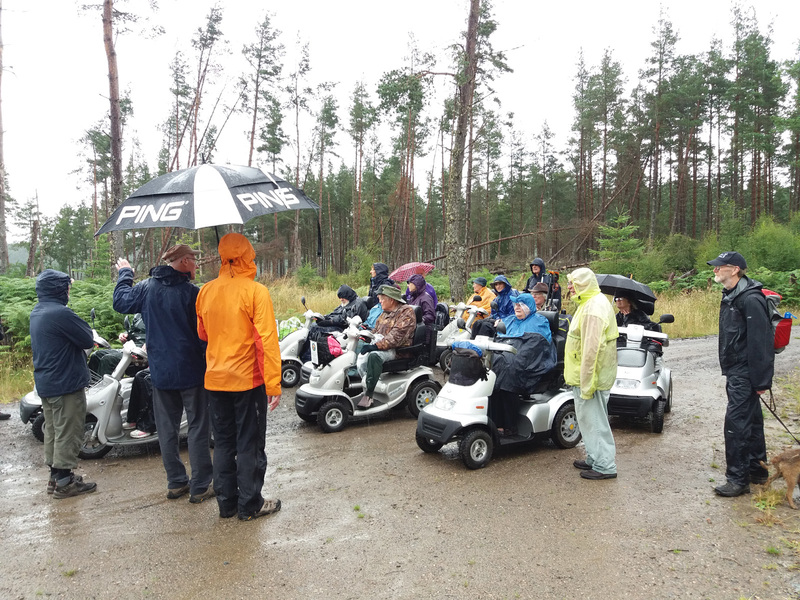 We set off across the golf course in blustery weather, passed notices informing us which fairways we were allowed to ski on, and into the shelter of the Anagach Woods. This is community woodland, gradually being returned to native woodland. Martin told us that the local volunteers, rather than get involved with the bureaucracy of chainsaws (training, safety certificates and so on) had sourced traditional two-person crosscut saws. They must be an impressive sight in action! 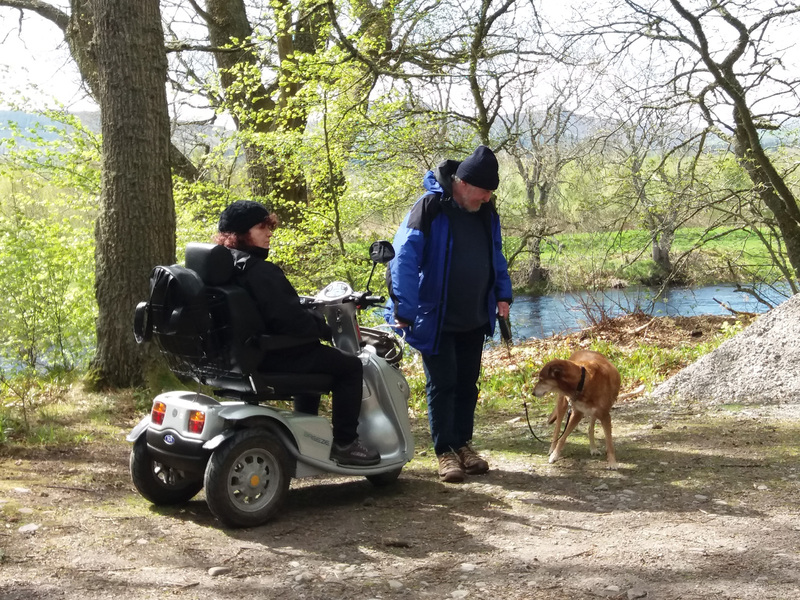 It was a lovely ramble along quiet paths through the woods to the River Spey. We had planned to take our lunch break on top of the old Spey Bridge (now closed to traffic, obviously), but the cold wind made this impossible. A great shame, as the view up and down the river from the crest of the bridge was spectacular, and it would have been a lovely spot. Instead we retreated to the Speyside Estates estate office, where they kindly allowed to us to shelter in the lee of the office building. After lunch we returned by the Old Military Road and back through the woods. At one point it seemed we were going to get rained on, and there was a flurry of activity and chaos as waterproofs were donned; needless to say, by the time we had struggled into our wet-weather gear, the shower had passed on. On reaching Grantown we emerged at a different part of the town, so we processed in state through the town square on our way back to the car park. Some of us enjoyed a hot cuppa and were tempted to cake at McLean’s bakery and cafe. All in all a very successful ramble, mercifully mostly dry though a little chilly, in a beautiful part of the country. 9 scooters and a spare met us at the car park opposite the Seaboard Memorial Hall at Balintore on a beautiful bright, warm sunny day with clear blue skies and a gentle breeze. Our party of about 25 guided by Tina, who knows the area well, and her 2 collie dogs, set off through the village towards Hilton, along a narrow street bordered on both sides by old fisher cottages, some with beautifully kept little front gardens, with pots of bright flowers. Buddleia bushes were everywhere, attracting butterflies and bees on this lovely day. We passed through Hilton, turned slightly uphill, crossed over a cattle grid and on to a grassy track next to the shore, below a steep hillside. Further on, some of the party braved a narrow path up the hill to emerge at the foot of a lovely grassy tree-lined driveway leading up to a grass terrace just below the Glenmorangie Hotel with fabulous panoramic views over golden stubble fields to the Moray Firth. It was reckoned a perfect spot for lunch! On the return journey we all stopped to admire the replica Pictish stone at Hilton of Cadboll. It bears the Christian cross on one side and secular carvings on the other. The original stone can be dated to around 800AD and the upper part of it is currently in the Museum of Scotland. We retraced our steps to the car park where most of the party made full use of the coffee, tea and homemade cakes available in the Memorial Hall. It was a perfect day out and huge thanks go to everyone who made this possible. Having just passed the Corrimony Chambered Cairn which dates back 4000 years, it was evident that the day’s weather was to be changeable with waterproof clothing required. Martin started off by welcoming all to the ramble with 21 persons taking part including new members Tom and Dannie Hunt. Martin then introduced local farmer Lindsey Girvan who, together with his wife Maimie and son David run the 3,035 hectare grass and hill farm. The area around the farm had a chequered history after the Battle of Culloden. Redcoat soldiers arrived and set fire to the castle and surrounding dwellings leaving only one building untouched because of a certain crest over its entrance. In the meantime the rain was starting so it was time to start the ramble. With the road being made of crushed shale, the rain made no impression on our progress and the scenery through the Corrimony Nature Reserve changed constantly. One minute we saw Scots Pine then Birch then minutes later heathered moorland. Later on into the ramble Martin gave a talk about the structure and layout of the forest as he had helped draw up the plans for its layout many years earlier. 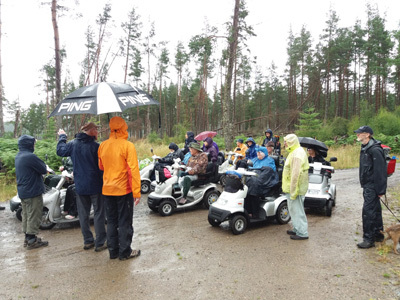 Having arrived at a suitable place for our lunch, and with the rain now having stopped, we were joined by Simon McLaughlin who is the RSPB Ranger for the Corrimony Nature Reserve who gave us a talk on what we were likely to see. Spring was the time to see Black Grouse eating energy packed leaf buds. Summer for the Common Sandpipers and Dragon Flies around water. Autumn you could see the Scottish Crossbill looking for seed laden cones on pine trees. With one eye on the clouds we set off again in search of Loch Comhnard which in the Winter plays host to Whooper Swans arriving from the Arctic Circle. Loch Comhnard turned out to be wind swept and with dark clouds looming we headed back to the start. What started out overcast and damp turned out to be a very pleasant outing. In heatwave conditions, we rambled at Beinn Eighe National Nature Reserve. 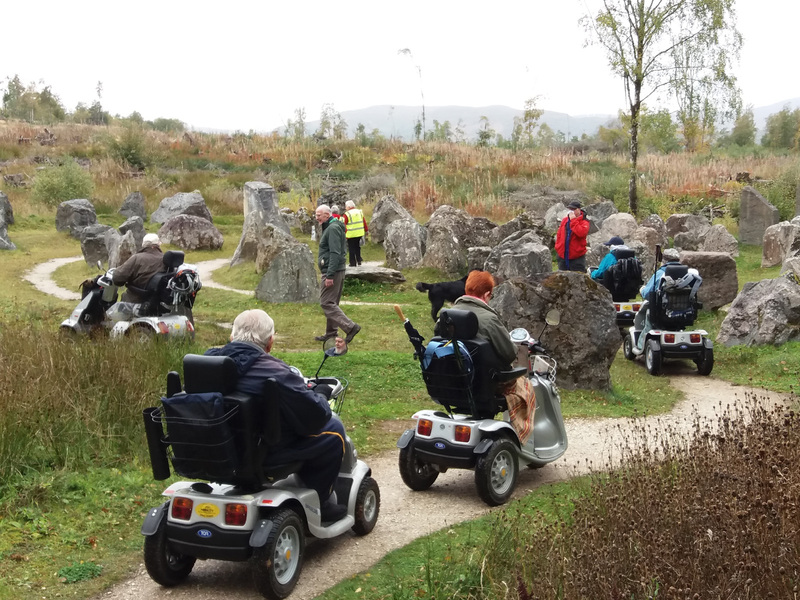 We set off from the visitor centre at Kinlochewe along a winding path under the trees, past stone “land art” sculptures and carved wooden totems. We were accompanied by Jack Ward, who is deer stalker and reserve officer at Beinn Eighe, and he proved to be an informative and entertaining guide. He explained what was being done in terms of returning the landscape to its original form, by taking out the planted spruces and other forestry trees and encouraging the regrowth of the native Scots pines, and “blurring” the straight lines of the edge of the planted forest. This procedure also involves managing the deer, which would otherwise eat everything in sight, and keeping their numbers to sustainable levels. 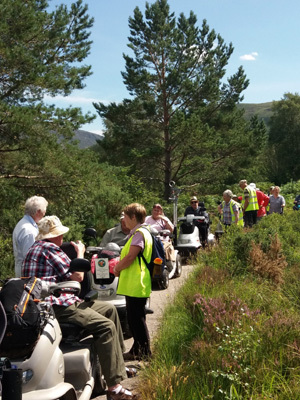 Emerging from the trees we began to climb gently through more open land, under a clear blue sky, with breathtaking views over to Slioch in the north, Glen Docherty to the southeast and the bare stony ridges of Beinn Eighe itself to the southwest. Jack told us to watch out for dragonflies (there are four types at Beinn Eighe) and Scotch Argus butterflies. As we dipped back among trees again there was also a profusion of delicious raspberries – although not so many after we had munched our way along the path! The viewpoints out on the hill were shimmering under the sun. There is almost something unnatural about rambling on the west coast of Scotland and, basically, being too hot! Certainly too hot to want to sit and bake ourselves over our lunch, and we stopped for our picnic in a little car park back in Kinlochewe, blissfully shaded by trees, before plunging back onto the trails of the Nature Reserve. All in all it was a glorious day, and we could not have seen this wild and beautiful area in better conditions; and the sun, and occasional gentle breeze, kept at bay the really dangerous wildlife – the midgies for which the area is renowned! 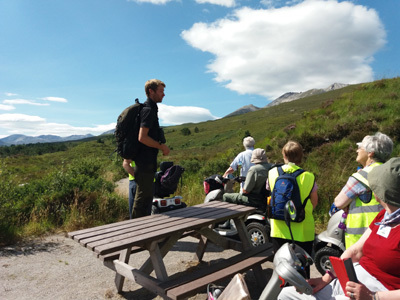 Beinn Eighe is the most distant of our rambles, and in the past it has been cancelled at the last minute because of atrocious weather; but this time it was a perfect day and more than worth the effort. And the raffle raised £30.00 – well done, everybody! On the ninth of July the Highland Disabled Ramblers had a pleasant ramble along some of the tracks on the south side of Loch Morlich in the Forestry Commission’s Glenmore Forest Park. After comfort stops at the Glenmore Visitor Centre we parked in the Hayfield Car Park. We had nine scooters, two as spares and for the walkers to ride on when they needed a rest. The tracks were mostly good and through open pine and mixed woodland, with occasional views of the loch. After the “great heat” of the previous week it was quite cool; there had been a little rain overnight, and mist still lingered on the hills, so walking was in a comfortable temperature, though maybe a little cool for those on scooters, but by afternoon the sun had broken through and it warmed up pleasantly. 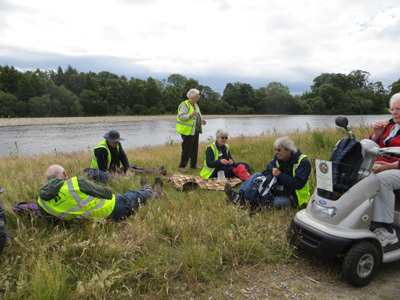 We found a seat and pleasant level ground under the trees by the side of the loch for our picnics, and we had our raffle draw there – we didn’t know what the prize was but Vic was the lucky winner. 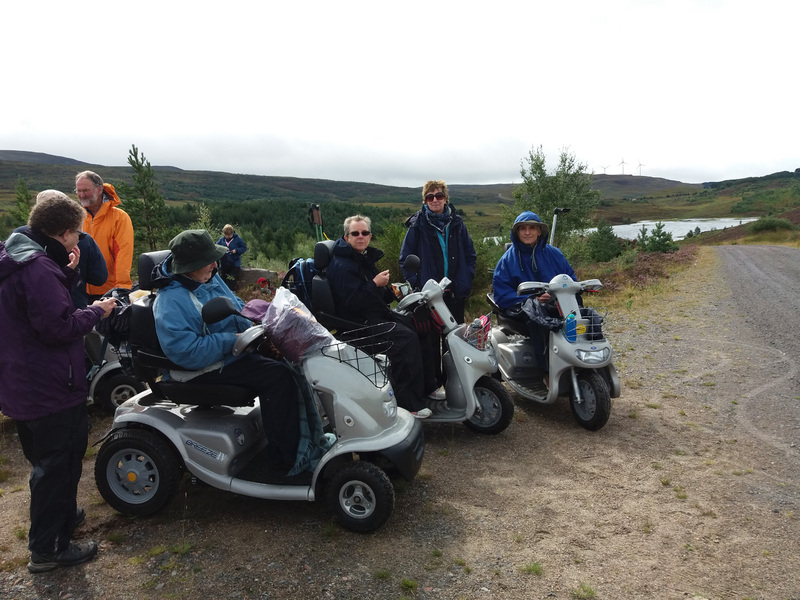 There wasn’t much wildlife around, with just a few mallard on the near side of the loch, but plenty of walkers, strollers, cyclists, and dogs, most of whom stopped to chat with us. It was a decidedly sociable outing! 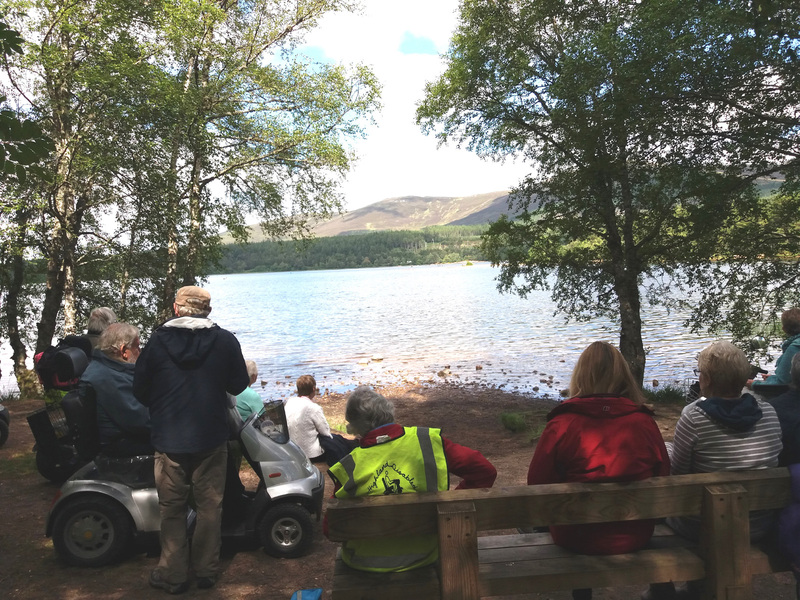 Some of us returned to the Glenmore Visitor Centre to indulge in tea and cakes, and more sociability – a very pleasant ramble, if a little further than usual. Many thanks to Nigel for leading us. The day dawned clear and dry but cloudy and was still that way when we all met in Lidl’s car park on the edge of Forres. We were welcomed by Martin and Wilson who then told us the plan for the day. In the past few decades Forres has been flooded, not only by the River Findhorn but also by the Mosset Burn. As a result of these floods we have had two flood prevention schemes put in place and we have previously rambled by the Mosset Burn scheme. This time we were to ramble across the much more extensive (and expensive!) scheme for the Findhorn. 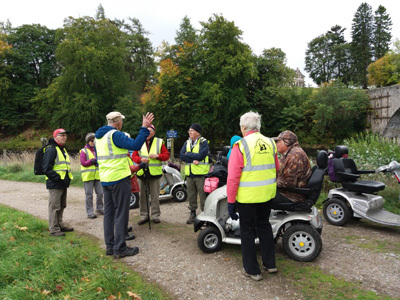 We started by going under the railway bridge to the west of Forres where Wilson pointed out that the bridge had recently been doubled in width. This is because Forres has had a lot of work done on its railway line, a stretch having been doubled to facilitate trains passing one another and we have also acquired a lovely new station. 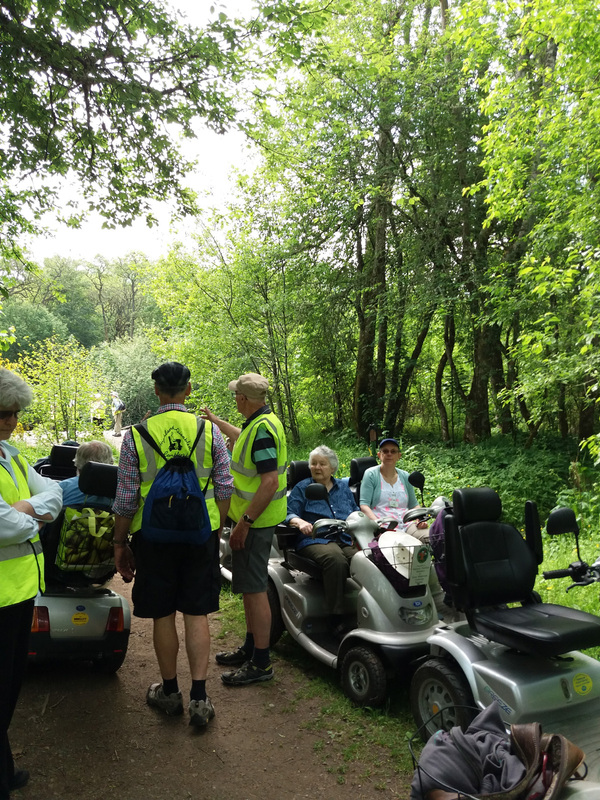 We rambled across the ground where lots of work had been done as part of the flood alleviation scheme admiring the many lovely wild flowers, shrubs and trees that had been planted. Amid all this beauty we couldn’t help noticing that there is still an awful lot of untreated giant hogweed about and one head of flowers was so big that everyone commented on it and many photos were taken. We duly reached the river which has changed dramatically during the work. It used to be relatively narrow here and was spanned by a Bailey bridge but it has been considerably widened and another three spans have been added to the bridge. After crossing we turned west, going along a footpath on the north bank of the river. The path stops a few hundred yards short of the Findhorn Bridge on the A96 so we turned back to a spot where we could see the traffic across the river and stopped here for lunch. We were across the river from a wooden hut from which wires stretched across the river and Wilson explained that this was part of the flood prevention scheme. The scientists hang instruments from the wires when the river is in spate and can take measurements which can lead to flood warnings being issued. Since we were there at the start of this dry spell the river was very low and it is difficult to imagine the changes which can take place very quickly after heavy rain up country, or more especially, when the snow is melting in the mountains. After lunch we rambled back to the new bridge when we then turned north, coming out on the “new” road which has been widened and which leads to the wonderful “Wastebusters” depot where all our recycling goes on. From there the road took us over a new bridge over the railway from which we got a lovely view, not only of the station but of Forres with its various towers and spires. From there it was a short distance along the side of the A96 to the car park. It was a lovely ramble with good crack and, as always, thanks are due to the folk who sussed out the route, drove the vans with the scooters, came as helpers etc and generally made the whole thing possible. A special thanks goes to Wilson Metcalfe who was an excellent guide. 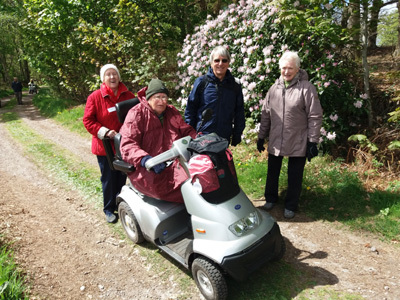 The Ramble was part of the Moray Walking Festival. As I parked my car at the Church of Scotland hall I noticed that the scooters had already been unloaded and were waiting in a tidy row near the vans. 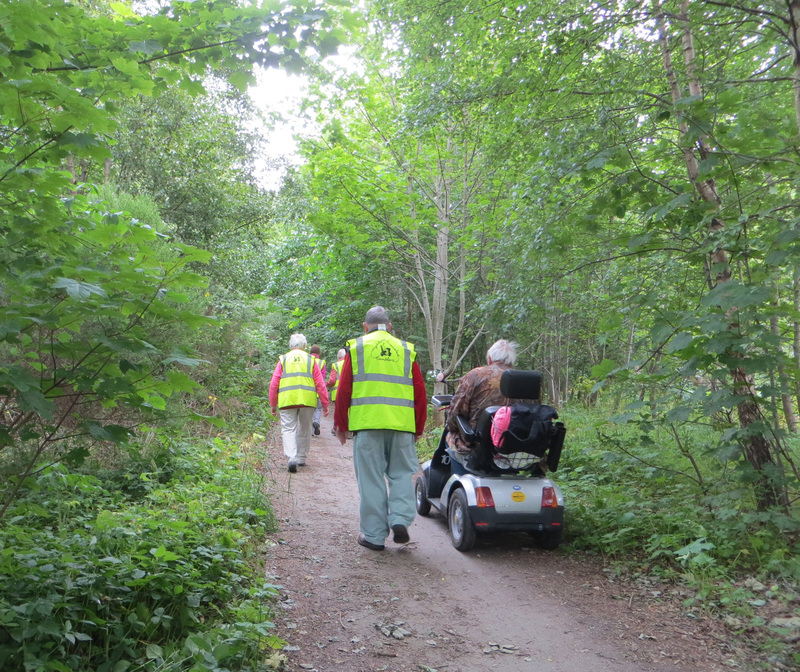 By 10:30 it was already hot as we set off, with Martin in the lead, on our pre AGM ramble. After a short walk along the back roads of Drumnadrochit we passed through the gate into Urquhart Bay Woodlands, which is managed by The Woodland Trust. This ancient wood is a fine example of ‘wet woodland’ where alder trees and others that thrive from floods grow well. Once in the woods we could enjoy the cool shade of the trees and the pungent scent of wild garlic. The bluebells were just past their best, but still much enjoyed. We strolled along the level path, following the River Enrick to our left, until it comes to a stony beach where the Enrick is joined by the smaller River Coiltie. Huge tree trunks are brought down during the floods and a metal suspension bridge over the Coiltie, giving access to the shores of Loch Ness, was washed away in 2007. It is only possible to cross the river when it is exceptionally dry. While some of us were exploring the beach, the scooters were turned around and we then retraced our steps back to the Church hall in time for lunch. The tables had been set out for us with a sumptuous array of cakes on each and a choice of tea or coffee was served by two ladies from the Church. We were invited to donate to the charity, Adopt a Child, which provides children in need with nutritious meals and medical and dental care. The raffle was drawn. The AGM was well attended and much appreciation was shown for all the hard work and planning which goes on, for our benefit, behind the scenes. I am happy to write this report as this is one of my favourite venues on the HDR programme. It was led by Rosemary and John. 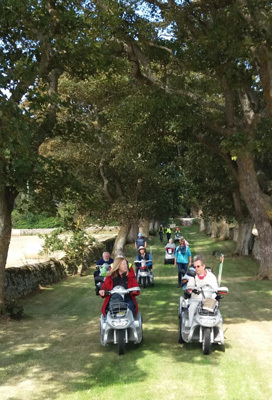 About 20 members, with full complement of scooters, met near the offices of the Estate in sunny but chilly weather. Most of the paths were wide and surfaces good, but there were a few potholes. There were lovely views of the hills throughout the walk. The Castle was built for the Mackenzies in the 1600s and demolished in the early 1950s and the rubble was used as foundations for the new Conon bridge. According to Andrew Matheson, the present owner, the Castle was demolished because “it was damp, draughty and dark with 6 feet thick walls and small windows. It was very big and had dry rot. No one could find a use for it.” The Castle had been used as Headquarters for the Norwegian Army in the second World War. After travelling past the oak avenue of old, magnificent trees we made a detour to see the grave of the last Lord Seaforth and the dog cemetery. We then went to the lake where a swan was nesting and lunched near the Conon river, then retracing our steps. The daffodils were past their best and the bluebells and rhododendrons just beginning to flower. Today the 4,000 acre estate has a farm, forest management, a small Caravan Club site, fishing, clay pigeon shooting and a number of holiday homes to rent. Most of the group met for refreshments at the Auction Mart near Dingwall, bringing to an end a most enjoyable day. Thanks to all who made this ramble possible. 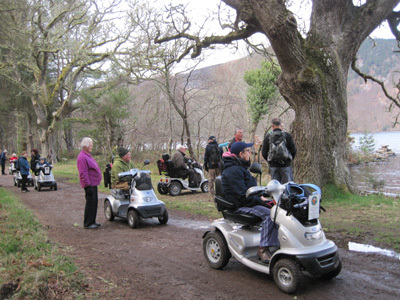 We gathered at the car park at the Dores Inn (once used as a coaching house from the 18th century on the Inverness to Fort Augustus road). There was a chilly breeze blowing off a choppy Loch Ness, but a few swimmers in their wet suits were still braving a dip. Once we set off, we were soon in the shelter of the bushes, which lined the back of the beach, but still afforded some lovely views, looking up the length of the loch towards Meall Fuar-mhonaidh (Gaelic for Cold Rounded Hill). We headed along a recently improved path towards Torr Point, where we went through a gate and entered the woods, which were made up mainly of pine, but also mixed with various other species of trees and broom. The path was generally good for the mobility scooters and wound round to Aldourie Pier, skirting the shore. At the remains of the pier once used by the paddle steamer ‘The Gondolier’, we stopped for a breather and a chance to take some photographs. 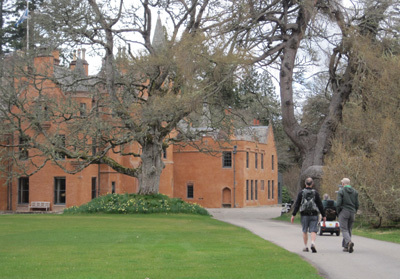 We then continued to Aldourie Castle, an impressive Scottish Baronial mansion, where Richard managed to acquire permission to ramble through the castle grounds. We found a loch side spot, strewn with daffodils and as we ate our picnic lunches, an osprey was spotted being mobbed by some crows, which added to the interest of the ramble. 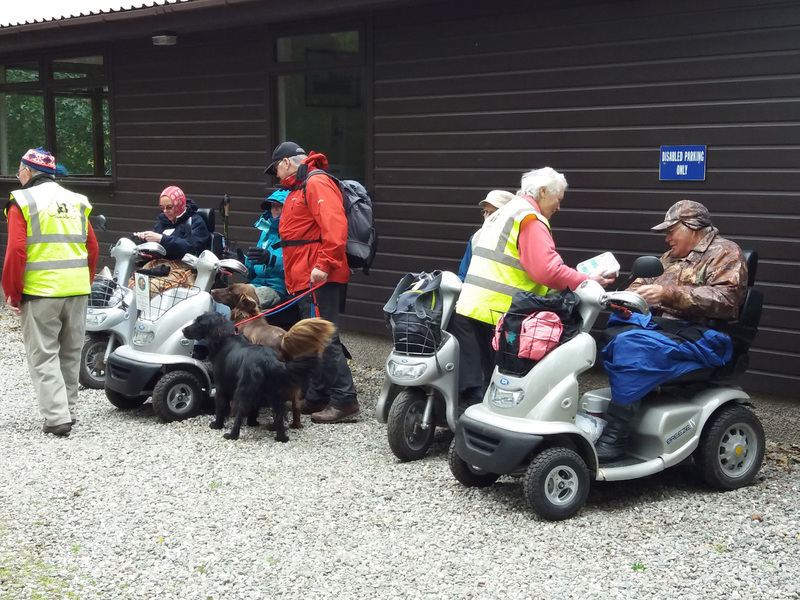 We then headed back to the car park, where we retired to the Inn for refreshments. 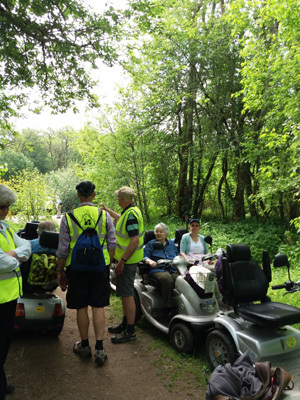 We were fortunate that the weather had remained dry with sunny spells throughout a very enjoyable ramble. No sightings of the monster were reported. Our last winter meeting was a talk by John Orr, Highland Council ranger for Inverness and around with a special interest in Ardersier Common. He spoke mainly about the birds, flowers and butterflies to be seen there. The ‘dingy skipper’ butterfly (a mottled brown job) with a 1 inch wingspan, is fairly rare in the Highlands. Its caterpillars feed on bird’s-foot-trefoil which is plentiful on the sandy shore at Ardersier. The ‘small blue’ butterfly (seen as dark brown with a hint of blue) is even smaller and feeds exclusively on the kidney vetch plant also found here. There are two small colonies of these butterflies at Ardersier and the local residents are growing and then replanting these vetches along the shoreline to fill in the space between the two colonies. This is to try and increase the butterfly numbers. John showed us photos of various plants that grow on the site and asked us to try and identify them. They included green alkanet (a beautiful blue), burdock and teasel (both with hooked seed heads), early purple orchid and the rarer coral root orchids. He also showed slides of a number of birds for us to name – chiffchaff, goldfinch, linnet and whitethroat. The site at Ardersier is carefully managed with good paths, suitable for wheelchairs. The area includes various habitats – seashore, scrub, old trees and seasonal ponds. An excellent talk, about an excellent well managed site, not far from inverness. The second of our winter meetings was Peggie’s annual quiz, and after a lunch of soup and sandwiches we settled down to be entertained, frustrated and humiliated in equal measure. As usual the questions were varied and occasionally surprising, and as usual half of us realised we had played our Jokers on the wrong round! Peggie’s quizzes are always interesting and enjoyable, and this one was no exception. So thank you, Peggie, once again; and I’m sure those of us who had forgotten (or never knew) that Hirta is the main island of the St Kilda group won’t forget it again! Time to start swotting for next year’s quiz, everyone. It was after a tasty soup and sandwich lunch that John and Rosemary took us on their wonderful adventure to the United States of America. They eventually reached their starting point of Salt Lake City after suffering the trials and tribulations of International travel. That meant arriving eight hours later than expected and their luggage a day later. The idea was to visit some of the National Parks, starting with Yellowstone then Bryce Canyon, Grand Canyon, and Yosemite to mention only the most popular ones. A whole range of wildlife vied for their attention including bald eagles, black bears, bison, moose, deer and chipmunks. The highlight of the trip was to view the eclipse, accompanied by the Japanese Astronomical Club, which proved to be a wonderful experience. The journey through to San Francisco, their exit point, was enhanced by a giant elk antler arch, 103 degrees F temperatures, hail storms, thunder and lightning, wild fires and scary railroad trips. As an aside the only reliable forms of transport on the trip were the Staten Island ferry and their hire car! We all enjoyed ‘our’ trip with John and Rosemary with their wonderful pictures and entertaining commentary.